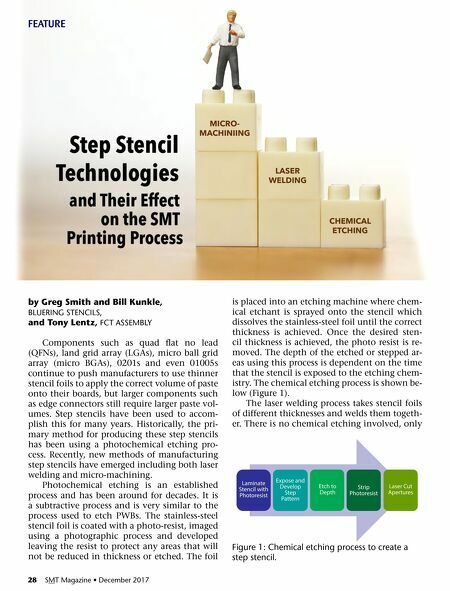 28 SMT Magazine • December 2017 by Greg Smith and Bill Kunkle, BLUERING STENCILS, and Tony Lentz, FCT ASSEMBLY Components such as quad flat no lead (QFNs), land grid array (LGAs), micro ball grid array (micro BGAs), 0201s and even 01005s continue to push manufacturers to use thinner stencil foils to apply the correct volume of paste onto their boards, but larger components such as edge connectors still require larger paste vol- umes. Step stencils have been used to accom- plish this for many years. 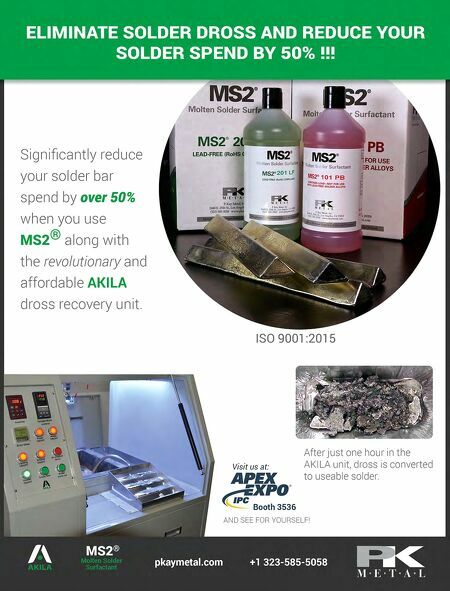 Historically, the pri- mary method for producing these step stencils has been using a photochemical etching pro- cess. Recently, new methods of manufacturing step stencils have emerged including both laser welding and micro-machining. Photochemical etching is an established process and has been around for decades. It is a subtractive process and is very similar to the process used to etch PWBs. The stainless-steel stencil foil is coated with a photo-resist, imaged using a photographic process and developed leaving the resist to protect any areas that will not be reduced in thickness or etched. The foil is placed into an etching machine where chem- ical etchant is sprayed onto the stencil which dissolves the stainless-steel foil until the correct thickness is achieved. Once the desired sten- cil thickness is achieved, the photo resist is re- moved. The depth of the etched or stepped ar- eas using this process is dependent on the time that the stencil is exposed to the etching chem- istry. The chemical etching process is shown be- low (Figure 1). The laser welding process takes stencil foils of different thicknesses and welds them togeth- er. There is no chemical etching involved, only FEATURE Figure 1: Chemical etching process to create a step stencil.